FMS Fire & Security have been promoted to Elite System Integrator status within the Gent24 Network. 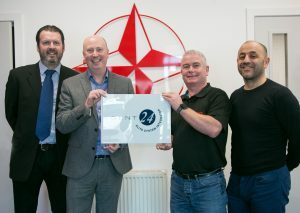 Last week Stuart Brown, Business Sales Manager for Scotland and Martin Lee, UK & Ireland Sales Leader of Honeywell Gent presented the FMS Fire & Security Directors with their ESI Plaque for their office. In our ongoing quest to offer extensive choice across our range of manufacturers FMS is pleased to be working with SigNET offering its range of Disabled Refuge equipment.